The Leaning Tower of Pisa sits in the sprawling Piazza dei Miracoli, but there are also other amazing buildings to visit and admire. Construction on the Pisa Duomo(the Santa Maria Assunta cathedral) began in 1063 by the architect Buscheto, paid for with the spoils received fighting against the Muslims in Sicily. The structure is a mix of architectural styles, reflecting the influences of the varied merchants of the day: classical, Lombard-Emilian, Byzantine, and Islamic. 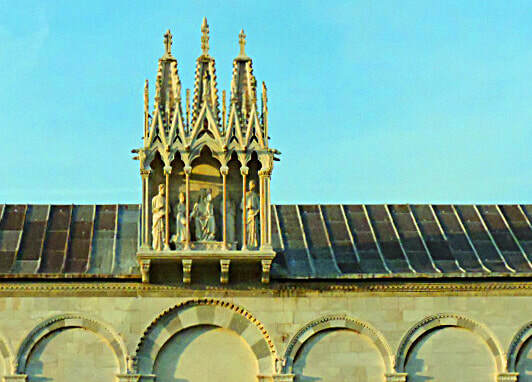 The church was erected outside Pisa’s defensive walls to show it’s lack of fear from outside forces. The cathedral was consecrated in 1118 by Pope Gelasius II, a member of the powerful Caetani family with links to both Pisa and Rome. 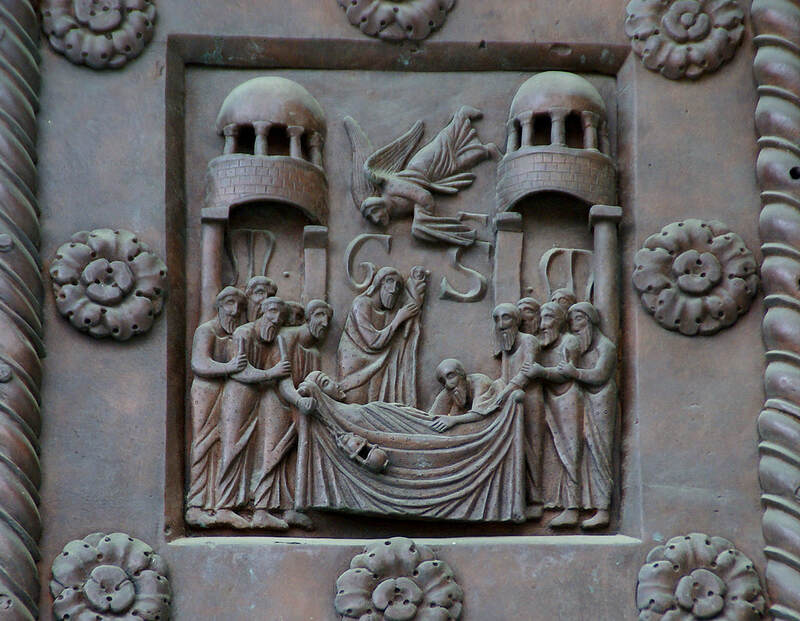 One of the 24 bronze panels on Pisano’s magnificent doors. 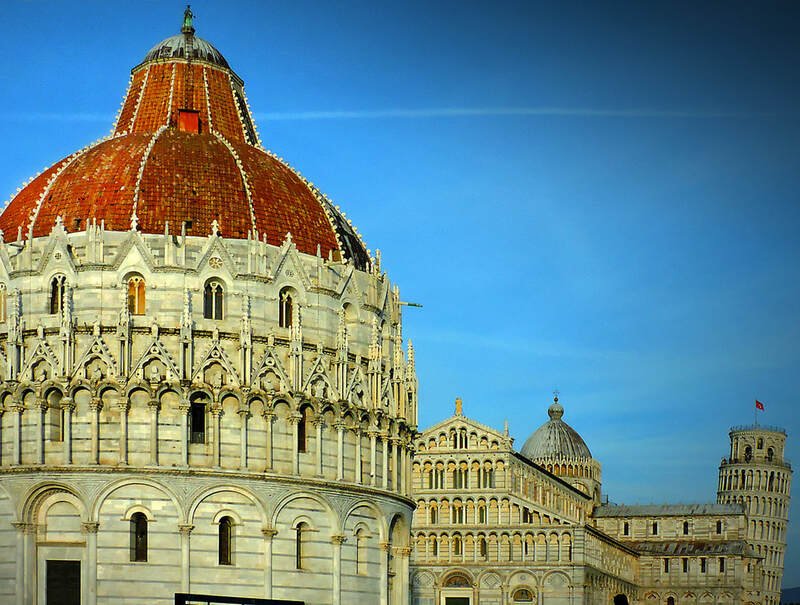 The Baptistry is the first thing you see as you enter the Piazza dei Miracoli. The construction of the Baptistery of St. John (Battistero di San Giovanni) began in 1152 to replace an older baptistry, and was completed in 1363. The baptistry was designed by Diotisalvi, whose signature is found on two pillars inside the building, dated 1153. 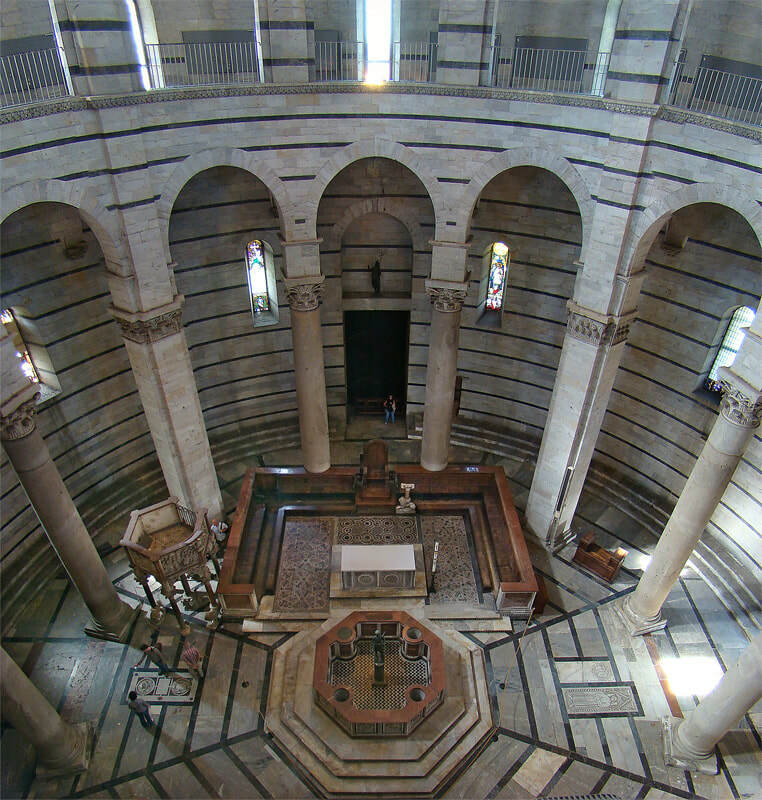 It is the largest baptistry in Italy, constructed with marble: 55 meters high with a diameter of 34 meters. It’s architectural style is a combination of Romanesque and Gothic–the lower section Romanesque, the upper section Gothic. 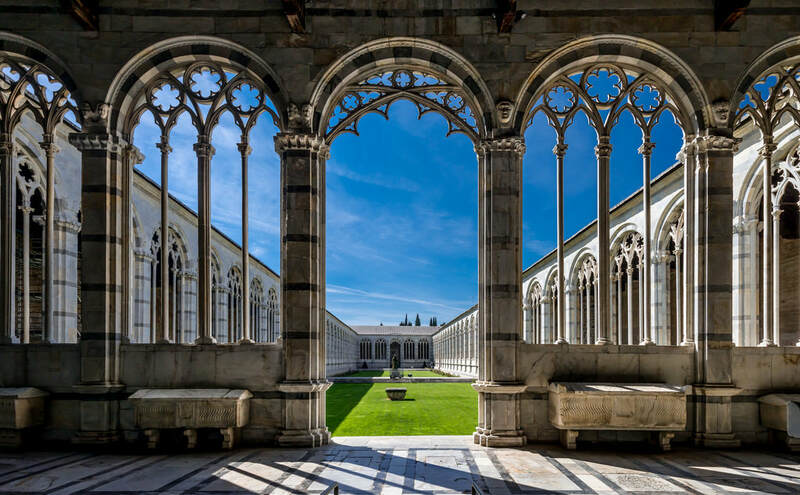 Built in the 13th century, the Campo Santo(Holy Field) Monumentaleis a cemetery built in the form of a cloisters, sitting alongside both the Baptistry and the Duomo in the Piazza dei Miracoli. Admittedly, it is the lesser-known of Pisa’s monuments. Legend claims it was built upon a shipload of sacred soil from Calvary where Jesus was crucified. It is said that bodies buried here will rot and ascend to Heaven in just 24 hours. The burial ground lies over the ruins of the original baptistery of the church of Santa Reparata, a church that stood where the Duomo stands today. 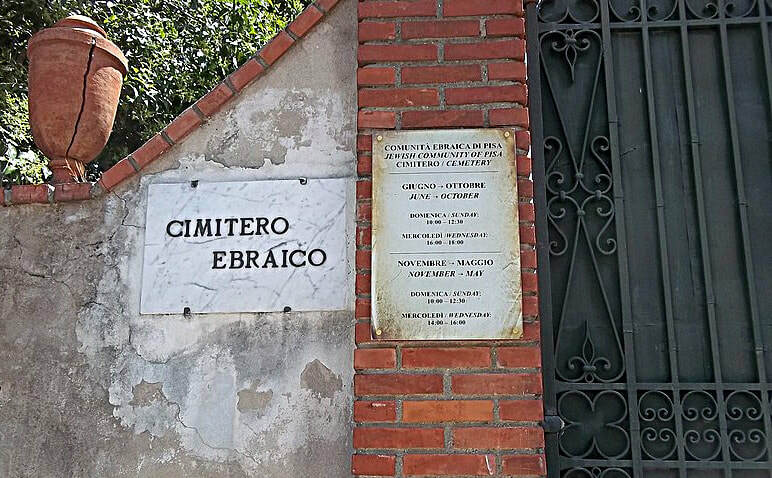 The cemetery itself is composed of three chapels: Chapel Ammannatiis, the oldest one; Chapel Aulla, made by Giovanni della Robbia in 1518; and Chapel Dal Pozzo, commissioned by Carlo Antonio Dal Pozzo, the archbishop of Pisa, in 1594. 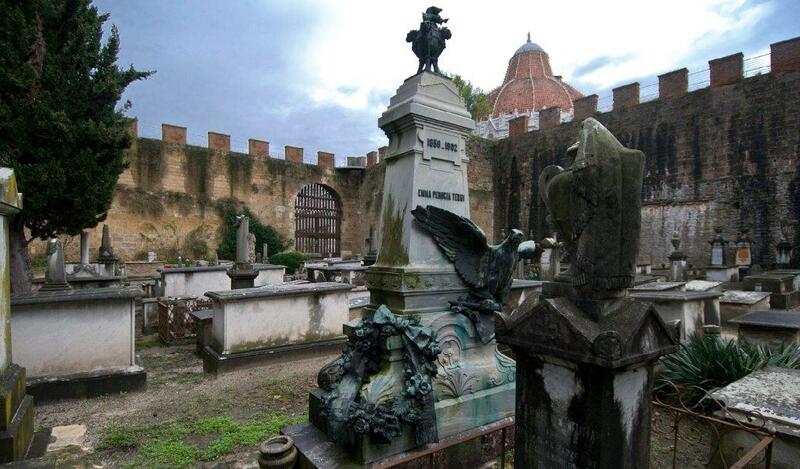 Just to the left of the Porta Nuovaentrance to Piazza dei Miracoli, and just beyond the ancient gates of Porta del Leonelies lies the historic Jewish Cemetery of Pisa, one of the oldest cemeteries in the world still in use. 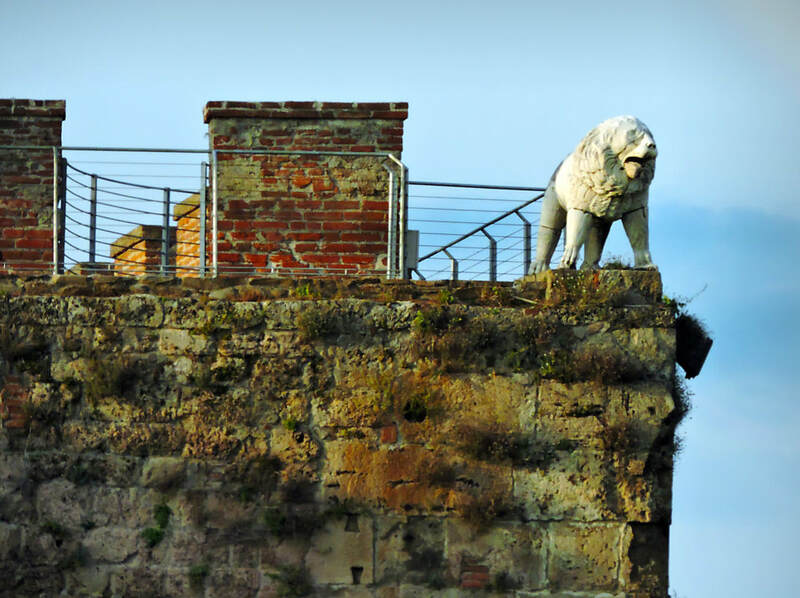 It is separated from Campo Santoitself by the medieval walls, framed by the Torre di Santa Maria, the Lion’s Gate and Torre di Catallo. If it weren’t for the walls separating the two cemeteries, visitors would instantly realize that fully two-thirds of the northern boundary of Piazza dei Miracoli is sacred burial grounds for two religions. In use since 1674, the current cemetery was preceded by at least three other Jewish cemeteries, all located outside the western walls of Pisa. 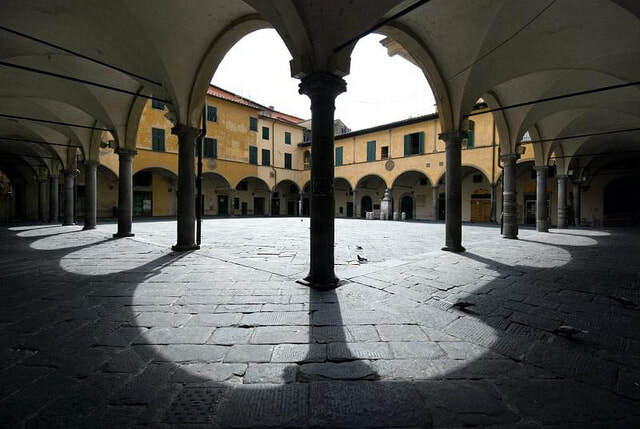 The first official mention of the Jewish community in Pisa dates back to 859 AD, and 13th century engraved inscriptions can still be seen to the right of the Porta Nuova. Historians believe that the poorest people were buried at the foot of the walls with their names engraved on the wall, all at the same height. Tombstones in the cemetery are unusual in that they have Hebraic inscriptions on one side and Spanish and Portuguese inscriptions on the other. This is because they were descendants of families expelled from the Iberian Peninsula in the 15th century. They also are engraved with the date from the the Gregorian calendar and and the Hebraic date. Many tombs are broken or tilted, not unlike the Leaning Tower, because of the poor soil. In the older part of the cemetery, the stones are under tall trees, giving you the impression that you are well outside of the city limits and away from the tourist throngs. Another interesting aspect is the tombstones marking the graves of children who succumbed to the 17th century plague. You will also find the graves of Jewish soldiers who fell during the First World War, Jews who were victims of fascist violence, German killings and Nazi-Fascist persecutions. A plaque on the wall of the mortuary chapel in the center of the cemetery lists names of those who were deported and disappeared in the extermination camps. As many of you know, it is Jewish tradition to place small stones on the graves of the departed, and you will find many stones in this cemetery as well. Some say the reason is stones last forever, while flowers would fade away–the love for people who have passed on never fades. Others say the stones help hold part of their souls down to Earth, where we can still spend time with those who have left this world. 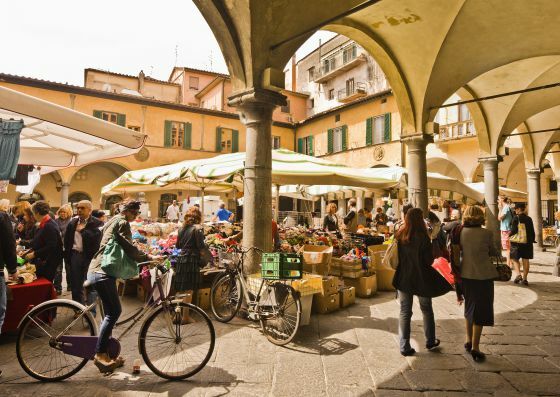 In the historic center of Pisa, Piazza delle Vettovagia‘s name describes its function… vettovagliemeans provisions in Italian. Literally, its name means Supply Square. 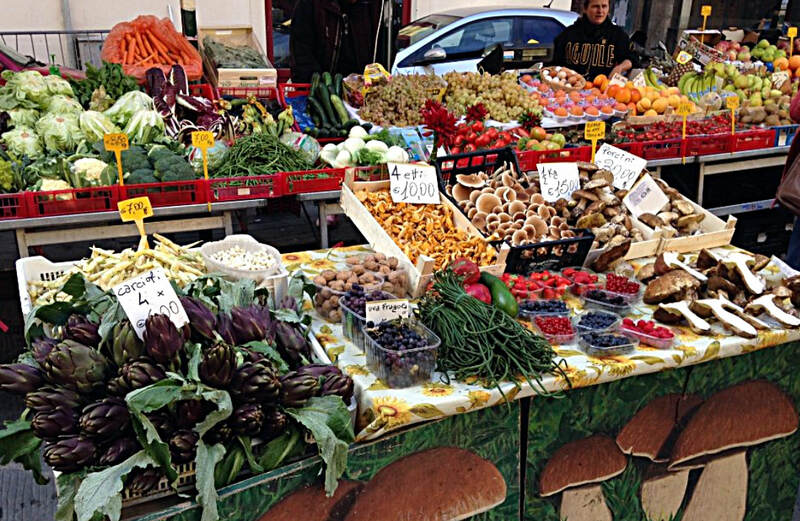 Unlike other town markets in Italy, which have only one day in which a piazza turns into a market, this Piazza becomes a local market each and every morning. Keep in mind, this is a market for where locals shop. Well worth a visit if you want to experience the realPisa. Residents can buy fruit, vegetables and other food products. 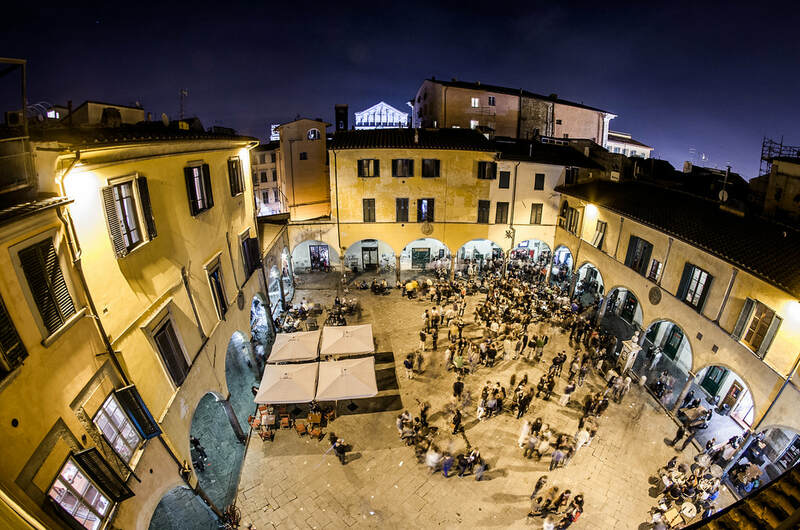 You will feel like you’ve been transported back to the Renaissance, surrounded on all sides by porticoes, the piazza boasting cafes, wine shops, butchers, fish-sellers, bakeries and spice shops. The Piazza is a great place to buy your provisions for the day, or for snacking or dining in a taverna under the portico. It is a particularly lively spot in the evenings where locals congregate, and because it is off the tourist radar, prices are more affordable. The Torre di Santa Mariais in the north-west side of the defensive city walls in the Piazza dei Miracoliand was constructed in 1155-1161. 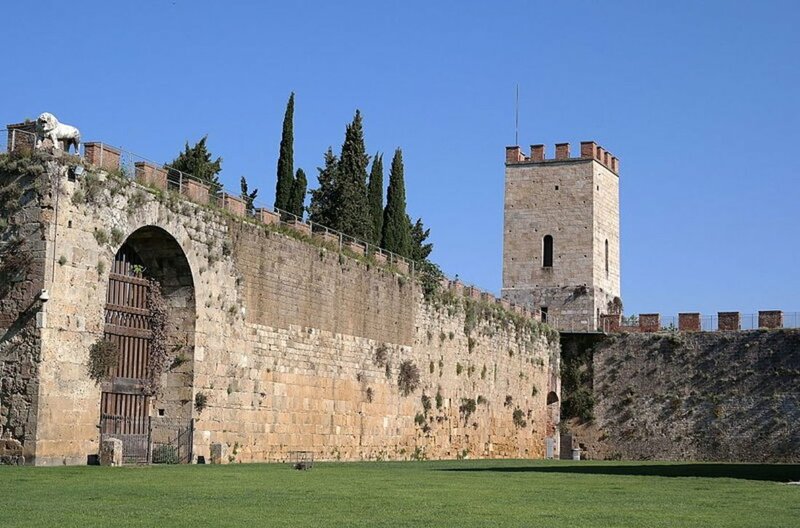 In 1499, during a siege by the Florentines, the tower was nearly destroyed and shortened to the level of the walls. It was reconstructed again in the 19th century. The walls themselves took nearly two centuries to complete, stretching nearly 4-1/2 miles with an average height of 36 feet, about 6 feet thick and are built using “Panchina” stone, a form of tufa stone. 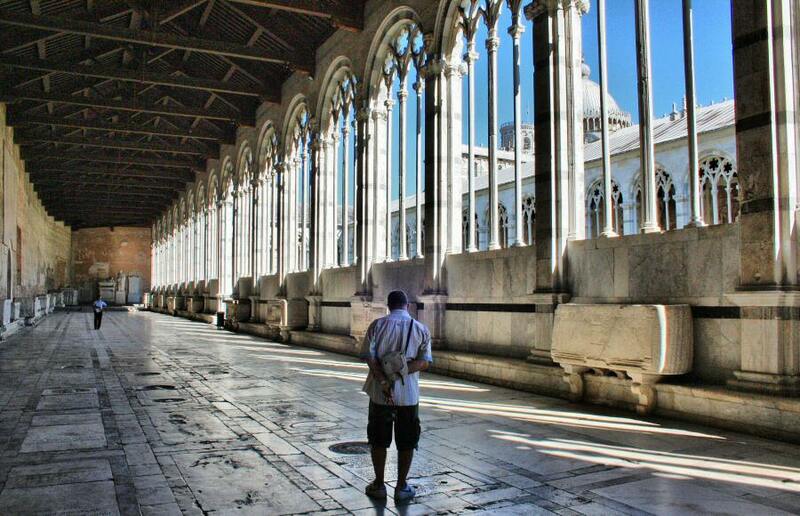 After years of restoration, visitors may now attend walking tours on the Pisa walls on selected days. 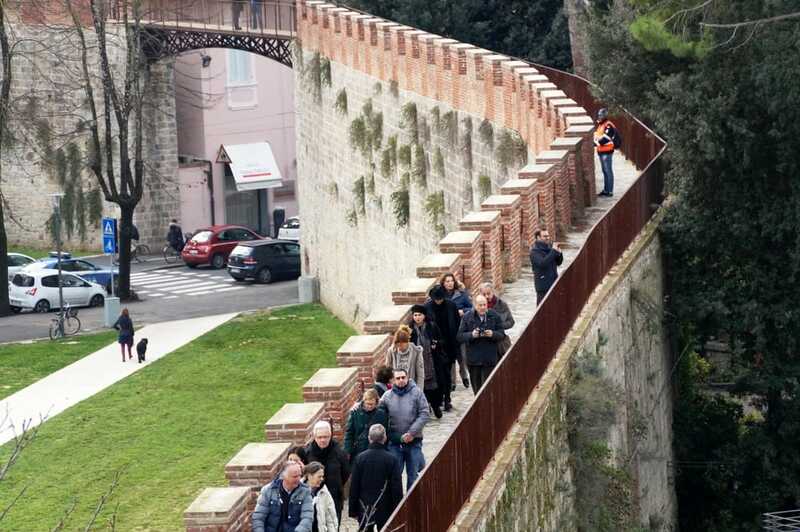 The three-kilometer path affords views of towers and ramparts, where you’ll also walk over the city’s four gates: Porta Nuovain Piazza dei Miracoli, Porta a Lucca, Porta San Zenoand Porta Calcesana. Generally speaking, the walls are open from April till September. At the time of this writing, the cost is 3 Euros. Parts of the walls are actually handicapped-accessible via elevators (for short sections of the ramparts). You should be able to buy tickets at the same places you buy tickets for the Leaning Tower. The hours are usually from 11am-2pm and 3pm to 8pm. (Please check with the Pisa Tourism Bureau for current dates and times. This is Italy, after all).